This coat is still impossible to photograph! It's all Rosy's fault again and it's another long story. I'll try to be brief because it's going to get in the way of the actual garment which I love very much. I did Rosy's New Girl's sewalong in December, Maider did too, I visited Maider's blog and really liked this sweatshirt pattern she tested, I bought the ENE pattern from Naii thinking I had the right fabric in stash, turns out I didn't have enough. 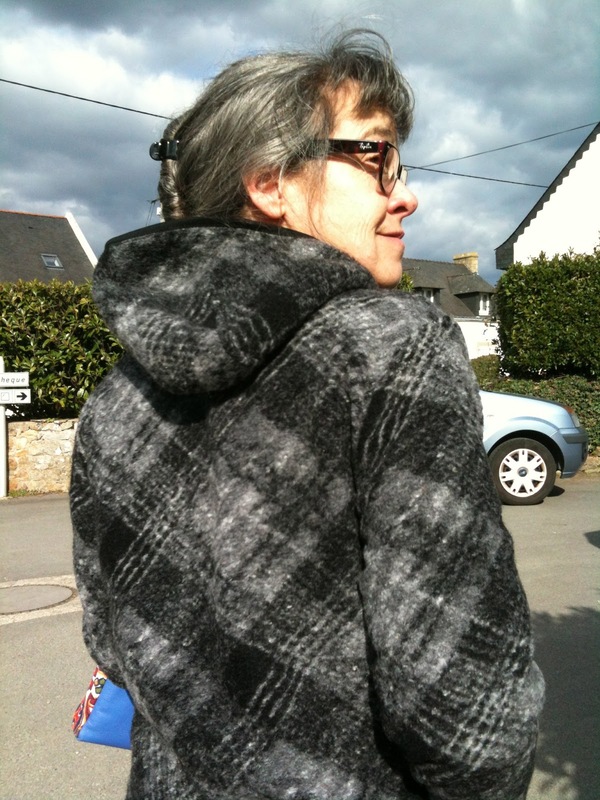 Later on, Maider said she had plenty of the fabric she used to make the hoodie and would love to do a swap. She chose 3m of Madras languishing in my stash, she sent me the printed plaid wool/polyester fuzzy jersey and I set out to work. The first thing I did was to redraft the hood. I didn't really like the 2 little horns the darts made on the top of the head so I copied a Helly Hansen polar fleece hood I really liked. It's a 3 pieces hood which is smaller and anatomically correct. The second thing I did was to line it with a couple of old t-shirts because Maider said the fabric was scratchy and she was totally right. The third thing I did was to taper the sleeve. The fourth thing I did was to use foldover elastic at the wrist, hem and hood instead of elastic bands. I first serged the lining and fleece together to facilitate the insertion. Some notes about the pattern : The instructions are in Spanish, they are full of pictures and easy to follow. There are no markings, no notches, you have to make up your own. I really like the way the front pocket is built, it's more flattering than a standard kangaroo patch pocket. There is a version for nursing moms which is very cool and there is a package with a children pattern so you can make sweatshirts for your whole family for 8€. If I have any misgivings, nothing to write home about really unless you are picky, they are about the sleeve heads and armholes which are the same front and back and they bunch up a little. I may correct that if I make that top again. This is a successful make, so successful in fact that I wore it every single day this week as the outside temperature dropped near 0°C and warmth was needed. Naii is having a very pretty top sewalong soon, you can join here. Rosy has just finished a very ambitious New Girl coat sewalong and Maider participated. They are both wearing hot pink Kate Spade knockoffs and I'm jealous. I thought that nice hoodie looked familiar and now I know I saw a "very" similar one on Maider's blog. Thanks for the heads up about Naii's sewalong. I only just discovered a few Spanish blogs and since Spanish is my mother tongue I'm amazed and delighted that the sewing bog community in Spain is so active. It's rocking! I wish I spoke Spanish! im still in awe of your red coat! 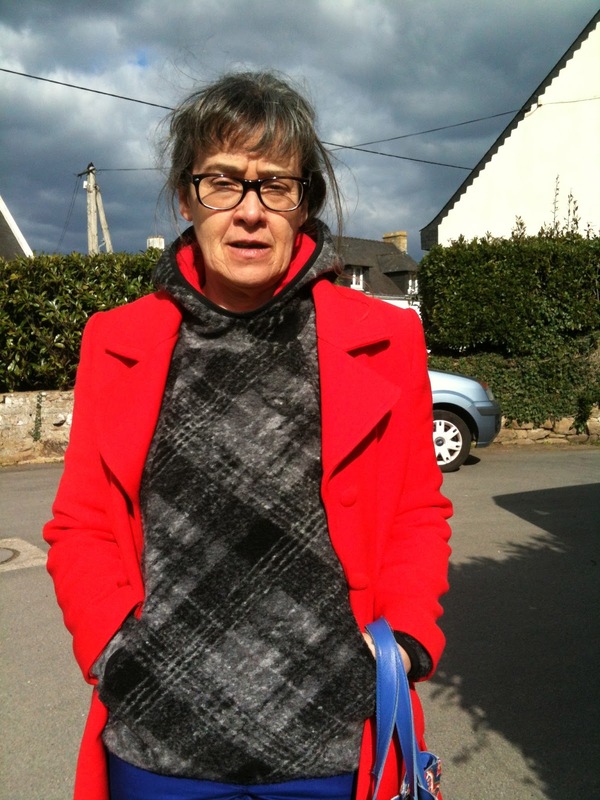 my red coat (the V8550) is still hanging on poppy aching to be finished! Thank you! A coat needs a lot of dedication, you'll get there. 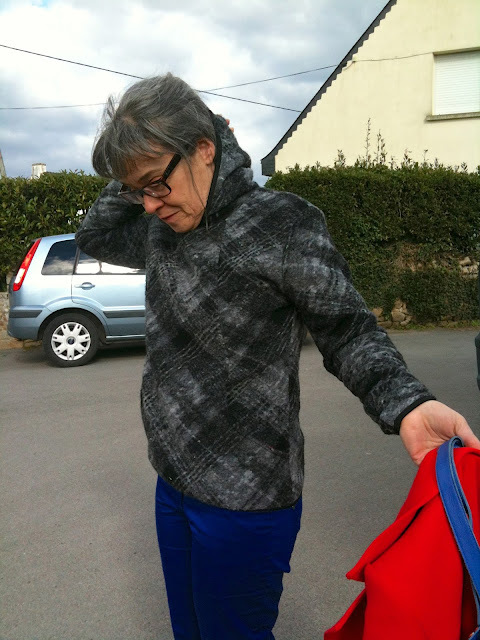 Hi, I think I saw your fabric exchange or your comment in Maider´s blog! I didn´t know you would use the same fabric. It´s MaiderENE twin sister! It looks great on you! About your pattern notes, I am improving, or hope so, I won´t pass them by for the next pattern! Keep up the good work, it's already a great pattern. Love it!!! I´m so happy that you like very much your version with my fabric. 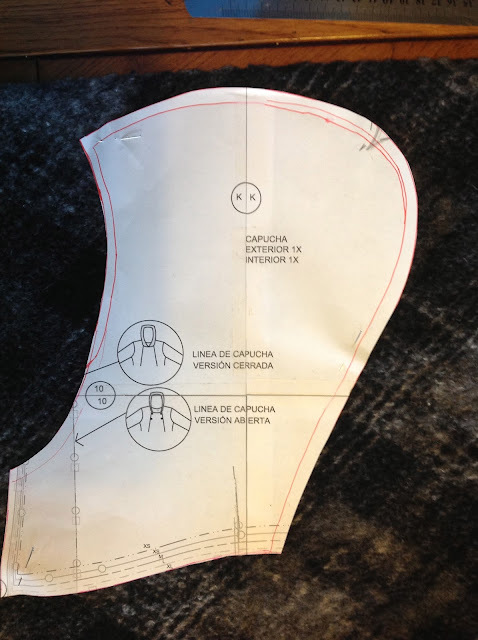 It´s a smart idea lining all the hoodie, maybe I will have to make it! We are ENE's evil twins!